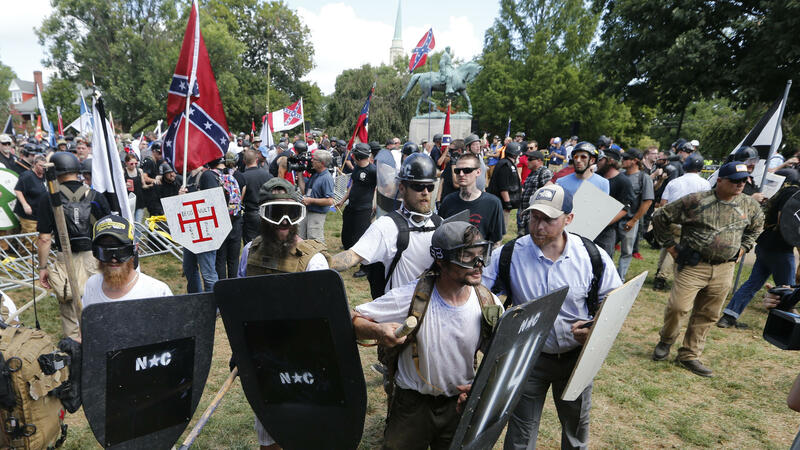 Alt-right demonstrators clash with counterdemonstrators at the entrance to Lee Park in Charlottesville, Va., on Aug. 12. 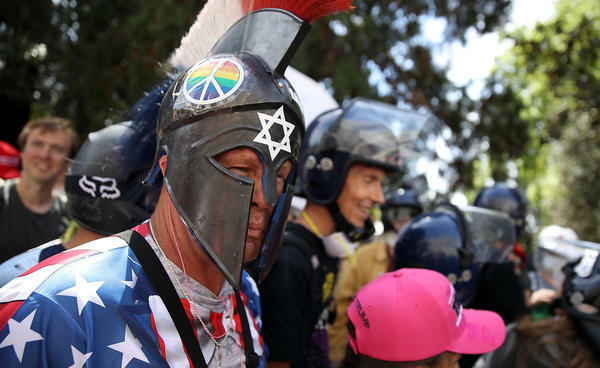 A right-wing activist wears a spartan helmet during a rally at Martin Luther King Jr. Civic Center Park on April 27 in Berkeley, Calif. Protesters gathered in response to the cancellation of a speech by American conservative political commentator Ann Coulter at the university. Just two weeks after a white nationalist rally in Charlottesville, Va., left one woman dead and ignited a national debate about racism, symbols of white supremacy and free speech, several alt-right groups planned to rally this weekend in the San Francisco Bay Area, unnerving residents, police and politicians. "Charlottesville has raised the stakes," said Jesse Arreguin, mayor of Berkeley, Calif. "So we are very concerned about any violence that could happen in our city." A far-right rally in Berkeley reportedly is also up in the air. The San Francisco Chronicle reports that an organizer of that event said in an email that she would attend but was urging other people not to show up. It's no coincidence far-right groups are targeting liberal cities long known for their embrace of leftist politics, free speech and diversity. Many on the alt-right see the West Coast's urban areas as centers of effete, out-of-touch, intolerant elitist "snowflakes." "Talk about kicking the hornet's nest! This is sure to be a barnburner," Kyle Chapman, aka "Based Stickman" and the "Alt-Knight," wrote on Facebook, urging supporters to head to the Bay this weekend, according to the Los Angeles Times. Chapman, who is popular among alt-right groups, fought protesters in Berkeley on March 4 and was charged with felony possession of a weapon and other crimes. On Friday, a judge told Chapman he was "to have no weapons of any kind — sticks, knives, pepper spray." "I've repeatedly put my life and freedom on the line," Chapman wrote, adding the hashtags #ResistMarxism #CrushCommunisim. "It's time to return the favor. I need all warriors to suit up and boot up this weekend." San Francisco Mayor Ed Lee expressed disappointment with the National Park Service, which granted a permit for Saturday's now canceled "Patriot Prayer" rally on the Golden Gate National Recreation Area's Crissy Field. Berkeley, historically a center of free speech activism, continues to prepare for Sunday even though a permit application was denied for what has been dubbed an "anti-Marxist" rally. "They will be moving forward with an unsanctioned event," Arreguin says, adding, "We will not tolerate any violence committed by anyone. If things get violent we will make arrests." This will be the fourth major street protest in Berkeley in just over a year. In February masked protesters smashed windows, lit fires, shot fireworks and tossed metal barricades during a planned speech at the University of California, Berkeley by far-right commentator Milo Yiannopoulos. The speech was canceled. And in April, running street battles broke out in downtown Berkeley between pro- and anti-Trump groups. But the recent death of a young woman in Virginia during a Unite the Right rally has exacerbated concerns. "We take our historic role and responsibility to protect freedom of speech very seriously," Arreguin told NPR. But addressing extremists on both sides, the mayor said violence is not free speech. "When you come to an event dressed as a soldier for battle you're not interested in free speech, you're interested in a brawl." Area police have canceled all vacation and time-off requests. Berkeley has asked for mutual aid police assistance from neighboring communities. In San Francisco, police and the Park Service had banned people from carrying a long list of items to the event, including helmets, tiki torches, selfie sticks, drones, bicycles and any weapons or firearms including by those people with concealed-carry permits. Gibson, founder of Patriot Prayer, had insisted his event is searching for common ground and not open to the far-right. "No extremists will be allowed in," his group posted on Facebook. "No Nazis, Communist, KKK, Antifa, white supremacist, I.E., or white nationalists." The pro-Trump supporter has denounced the violence in Charlottesville. And Gibson insisted to a local TV station in Portland, Ore., he isn't a racist and doesn't want racists at his rallies. "I'm brown so I'm definitely not a white supremacist, definitely not a white nationalist, definitely not a Nazi because I want limited government," he said. "Hitler was all about big government." But Gibson's rallies have featured white nationalist speakers, and his group's events often attract a wide range of racist white nationalists, conspiracy theorists and anti-government extremists and militia types, says Brian Levin, director of the Center for the Study of Hate and Extremism at Cal State, San Bernardino. "The anti-fascist movement does think [Gibson] is an extremist and an antagonist and wants to, quote, 'shut them down.' So that's why this stuff can go south pretty quick." "[Gibson] either has people that he invites or tolerates people who are dyed-in-the-wool extremists," Levin added. "There is a diversity of people who show up. But whether or not you put the fly in the soup or just allow flies to go into your soup, you still don't want to drink the soup." Members of the anti-fascist or antifa groups in the Bay Area, some of whom embrace violent tactics, have vowed to disrupt both alt-right rallies. Members of the anti-government militia groups called Oath Keepers and the Three Percenters say they're sending supporters to the Bay Area. The Anti-Defamation League's Center on Extremism says the organizers of both rallies this weekend appear to be what it is calling the "alt-lite" variety: far-right supporters who reject overt displays of white supremacy but who often embrace xenophobic, misogynist, anti-Muslim, anti-immigration and anti-Semitic ideas. But the ADL's Joanna Mendelson notes that both movements' hateful ideologies are changeable. "The fluidity to these groups is in the fact that some adherents can't be neatly and squarely characterized in one category over another. Both groups echo xenophobic and often misogynistic tropes, but the line in the sand, in where they stand, is defined by their views on white supremacy and anti-Semitism," she says. "These rallies always have the potential of attracting dyed-in-the-wool white supremacists who seek to insert their racist agenda into possible firestorm events," Mendelson adds. California has seen more than two dozen political street brawls in the past two years, including a bloody neo-Nazi rally in Sacramento, during which at least seven people were stabbed. And a KKK rally in Anaheim last year also turned violent. Levin at Cal State reports that hate crimes were up 14 percent in California's largest cities in 2016 and have risen as well in major "blue state" cities. Meantime, San Francisco Mayor Lee is urging residents not to show up but instead attend one of the many planned peaceful counterprotests, many of which are in keeping with San Francisco's free spirit culture. They include a "Stop Hate Human Banner" event on Ocean Beach as well as a mobile dance party called LovedUp. 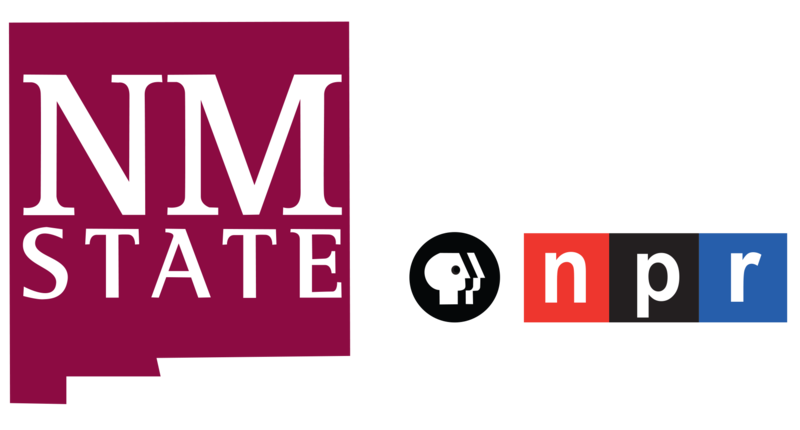 "The goal was to respond with a better alternative — one that's bigger, brighter, and more inclusive," Daveed Walzer Panadero tells member station KQED. "And hopefully draws more people who might not normally come to a political protest or march." And the group Calling All Clowns says its members will use wit and absurdity to "mercilessly ridicule any Neo-Nazis, white supremacists, or alt right trolls who dare show their face in San Francisco." Musician Michael Franti & Spearhead and other Bay Area artists and comedians are among those scheduled to perform Saturday at a concert dubbed San Francisco Peacefully Unites Against White Nationalists downtown at the city's Civic Center. "Let us show this nation that San Francisco is a city of peace and unity," Lee says.